VOGONS • View topic - Testing of a RWI Modified MT-32. Hello, long time lurker here, first time posting. I recently acquired an old model MT-32 and to my surprise found out it had been modified by RWI. As you may or may not know, this in addition to some hardware fixes, has a custom ROM revision M9. I did some searches here and on Google and Youtube and found no reviews or compatibility tests for this unit in DOS gaming. Maybe my search skills need some help. If the ROM can cause an issue with DOS gaming, can I just revert it to 1.07 with the hardware modifications? Can anyone point me in the right direction? If there hasn't been any real testing done, is there anything that the community would like to see tested? I also have a military electronics background so I will probably be trying to make a schematic of the RWI modifications if anyone would find that useful. Re: Testing of a RWI Modified MT-32. More extensive modifications than I had originally anticipated. cool! Documenting the mod would be appreciated I am sure; and dumping of the ROM as well. I would put some electrical tape or a sticker over that EPROM window though. 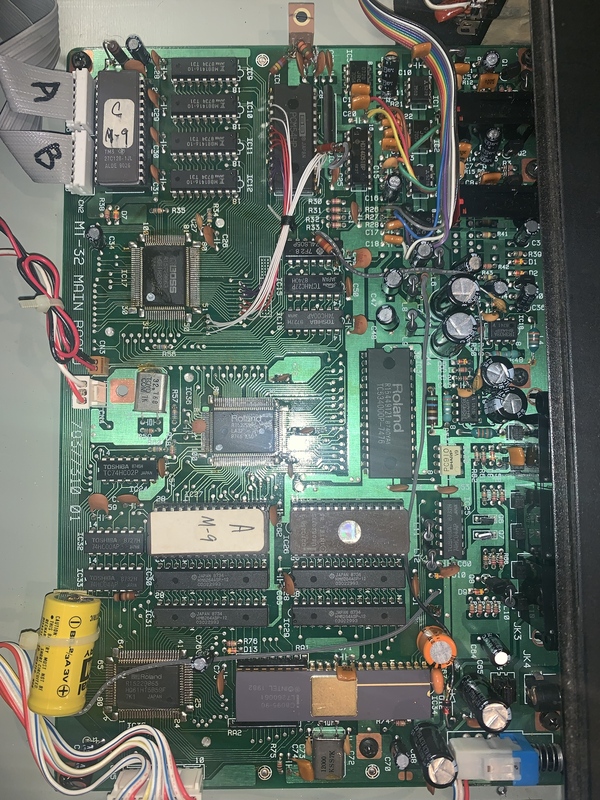 Already did It looks like the main ROM chip has been replaced with an EEPROM also. I am going out of the country in a couple of days on vacation, when I get back I will dump all 3 of them for archival before I do anything else. I had considered contacting the designer as he is still alive and kicking and his website is up and running for the schematics, but he seems to imply he wants to start modifying MT-32s again at some point. From reading the documentation, it seems his software modifications are all about adding additional features and do not appear to be related to the sound level and DAC fixes he designed. I plan on contacting him and seeing if he would be willing to verify I have the final version of the M9 software as there are 3 revisions. I'm also looking at this work, and while clean by 1990s standards It could be greatly improved today. I would put the PCM in a socket with a breakout board and do the connections that way. To be honest, I could see all the components of this mod being put on a custom designed PCB, and done a quite a bit cleaner than what I'm seeing here. Looks like I have a project for the summer. I guess if this one is a project I should consider buying another MT-32 as I believe this one is fairly rare. about the original author still wanting to offer the service - I find it kinda hard to believe? maybe the webpage is just decades old? He updated it about 8 months ago. I’m going to send him an email when I get back from vacation. I can’t do any testing until my PCMIDI card arrives or I go but a gameport/MIDI cable. at some stage I do MT-32 mods, I will let you know." I bought an extremely rare D-110 with mods by RWI which I haven't had a chance to listen to, even after 3 years, so hopefully I can do that, and ask him again too.